To provide a floral centrepiece service to clients with appropriate flowers in a consistent colour theme a for a specified budget, easily. Divided into four price points and four colour themes to make it easy for clients to select flowers for their event. Perfect for weddings, caterers, restaurants, corporate events. 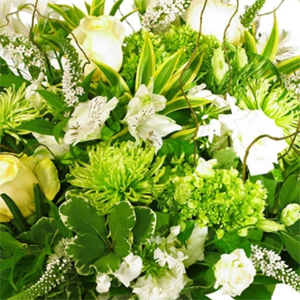 Predominately white flowers with green accents. 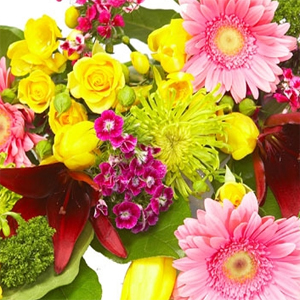 Flowers that have significant colour saturation such as hot pink, orange, purple, red and yellow. Flowers in soft, muted colours such as light pink, lavender, white and soft yellow. 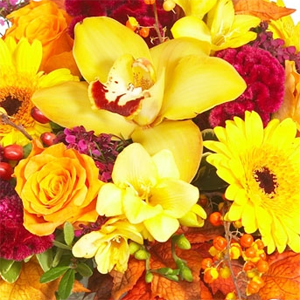 Autumn Shades Flowers in warm autumn tones which would include orange, yellow, red, rust, purples etc. $30 Table centrepiece(s) Approximately 4” Diameter, mostly suited to charger / bar tables. $40 Table centrepiece(s) Approximately 6” Diameter, suitable for either dining or charger / bar tables. $50 Table centrepiece(s) Approximately 7” Diameter, suitable mainly for dining tables. $65 Table centrepiece(s) Approximately 10” or larger in diameter and the customer can custom choose their flowers and colours. Preferably this would be done directly between Twigs and the customer due to complexity. $50 / $75 / $100 Feature Arrangement(s) Colour-coordinated and designed in an upright format suitable for bars, pianos, lobby tables, or as general décor. Twigs would supply flowers in the above colour ranges such as roses, lisianthus, tulips, statice, pinocchio chrysanthemum, gerbera daisies, miniature gerbera daisies, pin cushion protea, alstroemeria, miniature cymbidium orchids and others. With complementing foliages. For the $30, $40, $50, and $65 Centrepieces, the customer may choose the colour family. In industry parlance, the flowers selected would be “Designer Choice”. Flowers used in each arrangement will be depend on their seasonality, quality, and price point. For the $50, $75, and $100 Feature Arrangements, we continue the above approach, to simplify the customer’s decision on florals. With these, we have some leeway to work with the client, to add custom flairs to the floral presentation.